Some mathematical constants are difficult to explain, especially for young students. I believe that science is not only formulas and theory but also experiments. The best way to explain it to children is showing effects and results. All teachers know that mathematical problem solving can be challenging for young children, as they can’t hold abstract ideas in their mind for a sufficient period. 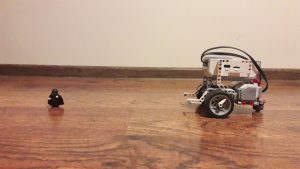 Mindstorms can make the difference. Last time we learnt how to use motors to steer and drive forward. 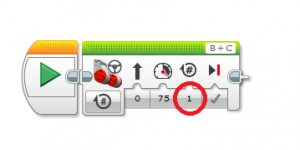 This time, we will learn how to use the EV3 to introduce π. Have you seen a large modern pharmacy? You can find robots there. Automated dispensing systems have been widely adopted in many countries. 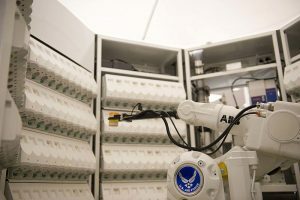 A pharmacist enters the quantity of a drug he or she needs and a robot retrieves the correct amount from a bank for shelves and puts them in a basket. It makes shopping faster and reduces the chance of a mistake. 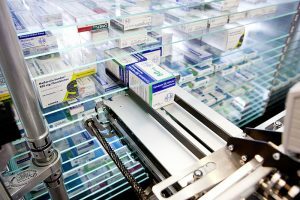 Dispensing systems must be very precise, because boxes for drugs are close to each other – a few centimeters either way and there is another drug. Remember – mistakes are not allowed! Let’s make a precise robot and learn how to drive an exact distance. Note: If your students are not so advanced to create their own robots you can use instructions for the Robot Educator Model. All values in the following part will be based on the Robot Educator Model. Put your robot on the start line with a LEGO minifig some distance in front of the robot. 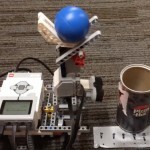 Your robot must drive as close as possible to the minifig without touching it. Just like a robotic dispensing system in a pharmacy – you need to be very precise. 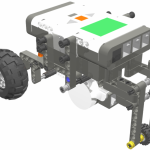 Create a program for your robot to make it drive forward a specified distance. For this exercise, we’re going to set the number of rotations. How many rotations do you need to achieve the goal? How many tests did you need? Can you count number of rotation instead testing this value? Do you know about circumference? Circumference is the distance around the edge of a circle. When your robot turns a motor for one rotation, it drives a specific distance, depending on the size of the wheel. Is there any relation between radius of wheel and distance? YES there is! If the diameter of the wheel is 5.6 cm, what is circumference? The correct answer is approximately 17.6 cm. This means that if a robot with a 5.6 cm wheel drives forward for one rotation, it should travel 17.6cm. What about two or more rotations? Can we determine how many wheel rotations a robot needs in order to drive from the start line to the LEGO minifig? Is the answer the same as the number of rotations determined through trial and error? If not, why not? 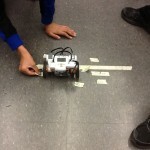 Give some time for your students to consider variables like power, friction, slip, and accuracy of the rotation sensor. Be sure that students understand that π is a real value that exists in everyday life – not just in equations – and that it’s useful.